Cyclists in the City: We're doing this so that you, your children and your friends aren't the next casualties of a systemic, killer culture of laissez-faire at Transport for London. We're doing this so that you, your children and your friends aren't the next casualties of a systemic, killer culture of laissez-faire at Transport for London. This week I have come under a lot of pressure from people with trenchant party-political views about the work that I have been doing with Mark of ibikelondon blog and the amazing volunteers from the local branches of the London Cycling Campaign who supported and marshalled yesterday's Tour du Danger - a tour of TfL's Top 10 Most Dangerous Junctions for Cyclists in London. Hundreds of people came together yesterday to push the Mayor to take cycling safety seriously. As the ride went on, it grew at each junction as cyclists joined in to support us. With the exception of one idiot black cab driver on the Mall (who tried to a) overtake 400 cyclists and b) plough into a marching band) the mood was unlike any other cycling event I've ever seen. Bus drivers leaned out and supported us. Pedestrians waved, cheered and clapped us. Some motorists were outraged at having to wait an extra 60 seconds until we passed. But the overwhelming majority seemed to understand and support our message. Joanna Lumley, we thank you in particular for your support on the day. And we thank the many London Assembly politicians and Simon Hughes MP who stood with us as well. Our key message was that we reject Boris Johnson's statement that major junctions such as Elephant & Castle are 'fine [to cycle around]...if you keep your wits about you'. I disagree with that statement on reasons of fact: 89 serious cyclist casualties in the last 24 months at that one junction alone - a rate of almost one a week. Let's just remember what a serious casualty might look like. The woman knocked from her bike on Parliament Square three weeks ago has a broken back. I know because she tells me how she is dealing with the collision, how she is worried for her career, how she needs help for the panic attacks she is suffering. I know that Mary Bowers - the woman knocked from bicycle by an HGV on her way to work at The Times - is still in a coma. The woman killed at Elephant two years ago was a very experienced cyclist: 'She often said that roundabout wasn't safe'. The Evening Standard pointed out "Something has to be done quickly to stop this kind of thing happening again and again." Two years later, Transport for London with support from the Mayor (it appears) is proposing to do almost nothing to change the roundabout when it re-models it soon. Remember these are all adults. Experienced cyclists. Their 'wits' may or may not have been engaged at the time. The woman I mentioned who was knocked off at Parliament Square is bright and articulate. I suspect she had her wits fully about her when she was shot from her bicycle. The wife of Brian Dorling - the first of two cyclists killed in the last three weeks on the Cycle Super Highway at Bow commented on the BBC website last night that while watching the reconstruction at Bow roundabout, she had seen three cyclists experience near-misses. In a separate comment to a road.cc article earlier in the day, Mrs Dorling had said: “Whoever designed the superhighway on that roundabout is completely negligent,” a point she reiterated to the BBC. What has surprised me this week is that I have come under pressure from a number of people for my 'political views'. A number of people who support the Mayor have accused me of being blinkered by 'my political leanings'. If only they knew what my political leanings are. But they don't. The fact is that I am not doing any of this to be anti-Boris Johnson. Nor to be pro-Ken Livingstone. The fact is that this is above party politics. The dangers that cyclists face on London's roads are not confined to Bow roundabout, to Elephant & Castle or to Kings Cross. They are about the way that Transport for London looks at London streets and about how it designs them in totality. They are about the culture of aggression on London's streets that impact all of us - drivers, cyclists or pedestrians. The problems are systemic. Transport for London truly believes that some advanced stop lines and blue paint is all it takes to make a street safe for people to cycle there. I'm sorry to say it so strongly but these are complete gimmicks. Just look at the insanely dangerous scheme that Transport for London proposes for the new Cycle Super Highway between Victoria and Peckham. It is repeating the designs that have killed people again and again at Kings Cross, at Bow and at Elephant. And it's not good enough. I believe it takes much more. It needs real facilities for people so that they can cycle safely without exposure to HGVs, such that a 14 year-old could cycle to school. Iain Dale, I'm not sure if you're with me on this point about children and cycling. A teenager should be able to cycle to school in London. That isn't the case at the moment. But it ought to be. 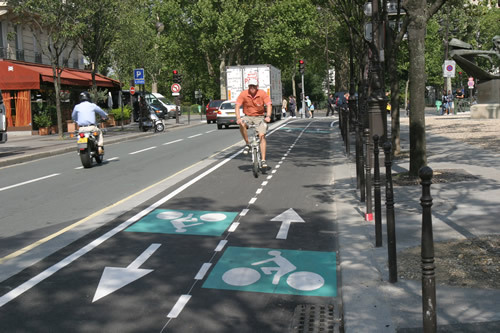 It is not the job of cycling charities to design streets that are safe for cycling. It is the job of Transport for London and the boroughs. And it is the job of the Mayor to set the pace. Not to abdicate all responsibility for unnecessary deaths with a fatuous comment about people who don't have their wits about them. We thank those of you who came. We thank those of you who marshalled. I also want to thank the Metropolitan Police teams who have supported and advised us. But more than that, we thank the Londoners who didn't come but who saw us and who supported us on the day. We're doing this so that you, your children and your friends aren't the next casualties of a systemic, killer culture of laissez-faire at Transport for London. Thank you for putting so much time into this. For anyone who get's hung up about being pro or anti Boris (or Ken) - I hope that between now and May they will both feel the heat of our anger. When both of them feel they need to do something about this then we'll get somewhere. I was on the Tour and I was horrified to learn at St. Mark's Church grounds that another fatality had occurred. Many, many thanks for organising the ride. The marshals deserve a round of applause too. If we have to do it a hundred times to make TfL et al take notice then count me in! I was responding to Christian Wolmar's Tweet, saying that the WHOLE superhighway scheme ought to be reevaluated/suspended. I said that was a knee jerk reaction to two terrible incidents, which for all we know were caused by any number of things. I cycle myself. After 20 years of not cycling I now use a Boris bike several times a week and enjoy the experience very much. I think London has made huge strides in becoming much more friendly to cyclists, but clearly more can be done. I did indeed say I wouldn't let a child cycle alone in London. That is more to do with general safety than road safety, though. I would be less worried in rural areas. There are similarities here between car drivers and cyclists. Some car drivers I know go out of their way to avoid the Elephant & Castle roundabout. Just like some cyclists do. Both do indeed need to keep their wits about them. There are lots of car accidents there too. I doubt whether any junction like that can be made totaly safe, but you are right, those statistics speak for themselves and show that something must be done. The only political point I would make is that sometimes it would be nice if people acknowledged that Boris Johnson has done far more to promote cycling in London than any other politician has ever done. You can't reverse 50 years of more or less ignoring cyclging in 3 years, but the introduction of the cycle hire scheme, the super highways and other lanes are surely things we can all welcome. These kinds of junctions can easily be made much much safer for cyclists (and pedestrians in fact.) The Dutch have worked all this out in detail over the past thirty years. The sticking point is that TFL models congestion as a physics problem, not an economics problem - so they don't model changes in demand from reducing capacity, or enabling modal shift by making different modes easier of safer. This means that nearly every change that might make walking or cycling easier or safer gets (wrongly) blocked on the basis that it will increase congestion. Apart from the rather obvious point that the London mayoral elections come round again next year, I very much hope we can keep politics out of this. We have seen that support for improvements to the design of Blackfriars Junction was unanimous across all parties in the London Assembly, and against the Executive and TfL, so that support is clearly not anti-Tory. And bicycles are not the preserve of the poor, or the socialist or liberal-leaning, sandal-wearing vegetarian beardie. Anyone who travels into a mainline station like Waterloo will daily see a few dozen be-suited City types unfolding their Bromptons or Mezzos for the final leg of their commute into their jobs with accountancy and law firms, banks or brokers, just as you will see shopworkers, security guards, couriers and many others cycling around town. Some of the most senior figures in the most prestigious City institutions have lent their personal weight, and that of their firms, in support of improved cycling infrastructure. I would hazard a guess that a good proportion of them would cast their ballot in an election in favour of Mr Johnson’s party. Addressing the issues which discourage more people from cycling is not political. It is practical common sense. It is also good business sense – fitter, healthier staff with less absenteeism and less stress, getting to their jobs or visiting their clients more quickly and efficiently. @Iain Dale – Boris oversaw the introduction of the hire bikes and the smurf lanes, but their gestation long pre-dated his term as mayor. He is widely known to be a keen cyclist and in his case we know that it is not merely for show, for image-enhancement, but sadly he follows a libertarian view (which is not an exclusively conservative position) that says you can always ride a bike if you want to, and you shouldn’t need that much encouragement to do so. Increased cycling modal share is a Good Thing for any number of practical reasons, so this position really isn’t good enough. "I doubt whether any junction like that can be made totally safe"
Junctions can be made extremely safe for all road-users. The Dutch have done it. But it cannot be done if it remains a junction "like that". It needs a total redesign. And since it is scheduled to be rebuilt anyway, that is what needs to happen. "Boris Johnson has done more to promote cycling in London than any other politician has ever done"
What Johnson has done has been to talk cycling up while his general roads policies make it more dangerous, as the statistics show. We need to understand the difference between "promoting" cycling and "facilitating" it. The former is useless without the latter. Well Done Danny & Mark! Great piece and an amazing response to the event. So pleased to see it picked up by a variety of press. We are sorry not to have been able to join you all, but hope to make the next one. I have been working with Olaf http://cycling-intelligence.com/ detailing which local authority was responsible for the roadway of each of this years 15 cycling fatalities. Despite only controlling 5% of the road network, 53% of those killed where on TFL roads. I would really like to thank you for the work you have done so far. Despite the high numbers of people cycling in London, its really alarming how the road design is actually getting worse instead of better. For example, the recent redesign of Southampton row/Russell Square is mind boggling and extremely dangerous for cyclists (when coming from the east along Guilford street) when previously it was safer to turn right into Russell square, now you are dumped straight into two lane/oncoming motor traffic. But the worst is that they have filled in the roadway with bricks for a HUGE pavement, when they could have easily made this a safe way for cyclists to cross the junction and continue west through Russell Square. There is space to make this happen. Why are they (TFL?) spending money re-designing roads that are MORE dangerous, when they could so easily be making them safer. It's a crime and I really hope we can turn this around. Note especially the sort of traffic that appears in shot in the last 10 seconds or so! Iain Dale - "I did indeed say I wouldn't let a child cycle alone in London. That is more to do with general safety than road safety, though. I would be less worried in rural areas." I'm not sure what rural areas. As a 10 year old child I used to cycle unaccompanied round the country lanes near Chelmsford. As a keen adult cyclist I probably feel less safe now outside London than within. The number of cars on the roads has increased massively over the last few decades, and they're more powerful and driven faster. At least in London the speed limit nearly everywhere is 30mph - A-Roads and country lanes outside London are now a nightmare and cycle facilities in towns outside London are not any better in my experience. I think it is important to keep this party-neutral, as then it will become less likely that Boris and friends will listen -they will assume you are the opposition and act accordingly. If you look at the Border Agency situation (or indeed, News International), it's easier for the leadership to do a U-turn if they can blame their minions. It may not be true, but that's irrelevant here as your goal is not to score points, it is to effect change. If you can get Boris to change his mind today, that avoids getting sucked into a world view that says the only way to make progress is to support Ken, which polarises something that doesn't need to be so single-party. Well done for putting together Saturday's ride, I'm glad I made it (and glad the BBC didn't use the interview they did with me!) As for political leanings, as a reader of your blog for some time now, it's clear you try to keep cycling issues on the agenda of politicians of all colours, which is the way it should be! As for E&C, I encountered it twice on Saturday, only one time felt remotely safe for me, never mind an inexperienced cyclist - and I was in the moidst of 300-odd cyclists! I only ended up going round it on the way home as the road towards CS7 from London Bridge wasn't moving (Lord Mayor clogging up the streets - way more disruption than a few cyclists!) Nearly having a merc van collect me wasn't fun... Reduce the number of lanes, maybe fit lights too, yes it'll slow the traffic, but that way people on foot will be able to cross, slower traffic is safer for everyone. I can't understand why the powers that be still don't realise that London's raods can only take s much traffic and the average speed ends up being low as a result. I regularly leapfrog vehicles on my ride home from work (distinctive vehicles, rather than red buses and the like!) Seeing a truck at the Tower, then again at Southwark bridge and still with it at Tooting! Adjusting things like traffic light phases will have little impact on the flow (it will probably improve it as there'll be less time stationary or in very slow traffic) but what do I know?! Alternatively you can as well utilise Rochester taxis for biking to and from Rochester. Pre-booked mini cabs are a abounding addition that is bulk effective, safe and doesn't blot cat-and-mouse for bisected an hour in the rain aggravating to battery a cab on the street.